During growth, migration and differentiation, cells closely interact with the extracellular matrix (ECM). The harmony between cells and their environment is a key factor that maintains the normal architecture of tissues. Loss of growth control is not the only characteristic of oncogenesis, loss of control by the ECM is an important event that allows malignant cells to further progress toward invasion and metastasis. Changes in cell adhesion, proteolytic degradation of the ECM and cell migration have all been described during invasion of most tissues by tumor cells. However little is known of these changes in tumors of the central nervous system (CNS). 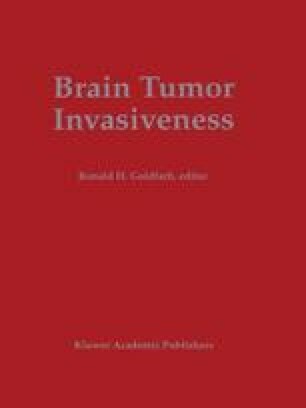 Although brain tumor cells may share some of the invasive characteristics of tumors that arise outside the CNS, the particular structure and composition of the brain ECM suggest the existence of unique invasive mechanisms in these tumors. Furthermore, the interaction between brain tumor cells and their ECM may explain the intriguing observation that despite their highly invasive behavior, these cells remain poorly metastatic. This review focuses on biochemical mechanisms essential for tumor invasion and how they relate to invasion of tumors that arise in the CNS.